Special Containment Procedures: SCP-1829 is contained at the vacant "Wild Springs" water park in Addison, Wisconsin, where it was originally discovered. At least two (2) Foundation guards are to be posted at the park's gates to prevent civilian access to SCP-1829. Once weekly, SCP-1829 is to be supplied with 25 kilograms of raw meat (see Addendum 1829-1). The pool at SCP-1829's base should be inspected following digestion, and any undigested remains should be removed by net and incinerated. As the "Wild Springs" amusement park has been marked condemned since 1979, no further containment procedures are necessary. 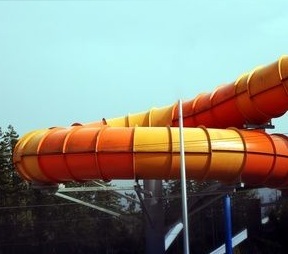 Description: SCP-1829 is an orange and yellow waterslide, approximately 19 meters tall and constructed of an unknown material. A spiraling wooden staircase has been connected to SCP-1829's entrance, allowing easy access from ground level. SCP-1829's structure curves twice before ending at a small concrete pool at its base. A pump system attached to said concrete pool supplies water to SCP-1829 on a constant basis. SCP-1829 appears and functions like a normal waterslide until a subject enters a section of tubing shortly after SCP-1829's second curve - at this point, microscopic pores on SCP-1829's surface will secrete a flesh-covered aperture of tissue, trapping the subject in place. SCP-1829 will then drain the selected area of water and begin flooding it with gastric acid1, effectively digesting the subject. After digestion is complete (usually spanning 4 to 5 hours) the fleshy aperture will begin to dissolve, and the digested slurry will continue into a rough intestine, where it is further broken down by a caustic mucus produced by SCP-1829. Any surviving material is pushed through peristalsis from the intestine, where it will continue down SCP-1829's surface until it is ejected into the pool at SCP-1829's base - as this water is later pumped back into SCP-1829, it is heavily polluted with gastric acid, bile, mucus, and bone fragments. If a subject enters SCP-1829 while it is digesting another subject (or multiple subjects enter the digestion area at once), SCP-1829 will produce additional webs of flesh to contain them until its initial prey has been digested, upon which subjects will be released and channeled into SCP-1829's "stomach". SCP-1829 was discovered four days after its installation at the "Wild Springs" water park, when a █-year-old child was digested and ejected in front of ██ civilians. The park was promptly seized by Foundation agents, and Class-A amnestics supplied to all civilians involved. Oddly, SCP-1829 functioned as a normal waterslide for the first four days of its installation until the incident. Addendum 1829-1: Following a long period without feeding, SCP-1829 attempted to digest its own surface material, leaving several caustic burns in the process. To prevent leaking of SCP-1829's fluids, its containment procedures have been revised to include weekly feeding. Results: Four hours later, small feathers and bones expelled from SCP-1829. Results: Five and a half hours later, small woodchips expelled from SCP-1829. Results: Seven hours later, block of iron expelled from SCP-1829, completely undigested. Results: As in Test 1829-3, undigested iron was expelled seven hours later. Results: Seven minutes later, SCP-1829 violently ejected the syrup along with 17 liters of gastric acid, flooding the pool at its base. Cleanup and draining took █ hours. 1. Analysis of gastric acid has shown a striking similarity with human stomach acid, with the exception of an abnormally-high amount of pepsin.